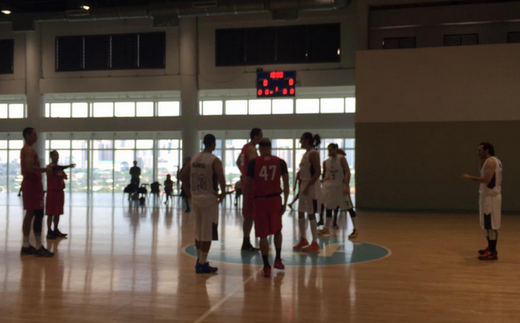 Ginebra wins First Tune-up Game against an International Team: Details Here! The Barangay Ginebra San Miguel wins its first tune-up match against an international team headed by former Gilas Coach Rajko Toroman and his FIBA Asia team Jordan via 94-85. The taller frontline of the Gin Kings dominated the Jordanians all throughout the ballgame. This is the first win of BGSM under new mentor Tim Cone. The Ginebra first five: Japeth Aguilar, Mark Caguioa, LA Tenorio, Chris Ellis, and Greg Slaughter, Photo C/O Charles Tiu! Labels: Ginebra wins First Tune-up Game against an International Team: Details Here!